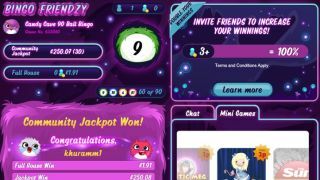 The current trend for big-money bingo has hit Facebook in the form of a real-cash gambling app called Bingo & Slots Friendzy. The app, the name of which sets the expectation bar fairly low, is Facebook's first app that allows gambling with real money and is available only to UK users of the social network. In line with UK law, you'll have to be 18 to chance your arm at some real cash prizes, with stringent "account acceptance controls verifying their identity" in place to stop younger players. Given that gambling is an addictive pastime, all users will also "have access to a number of self-help tools to limit their spending and exclude themselves from playing at any time". The UK is the "lucky" first country to get a social gambling app because of its "mature and very well-regulated gambling market" – non UK users won't see any stories generated by the gambling app in their news feeds, nor will they be able to access the applications from the Facebook App Center. Outside the UK, Facebookers will have to make do with chancing pretend money on apps like Zynga Bingo and Zynga Poker. The app has been created by Gamesys, the company behind Jackpot Joy and those irritating Barbara Windsor adverts. Jackpotjoy MD Michael Saunders said, "We've reinvented our exclusive Bingo and Slots games to appeal to the UK Facebook community. This marks an exciting turning point for the industry and a milestone for the Gamesys business." Meanwhile, a Facebook spokesperson made the point that the app is not a joint venture and has been developed entireley by Gamesys. They justified the move in a statement to us: "Real money gaming is a popular and well-regulated activity in the UK and we are allowing a partner to offer their games to adult users on the Facebook platform in a safe and controlled manner." Of course, there'll be a lot of money in it for Facebook if the bingo game takes off – there hasn't been any discussion of figures in the press materials, but given that Facebook was making 12 per cent of its income from Zynga back in February 2012 by taking a 30 per cent cut of Zynga's in-game purchases, you can bet that Facebook's taking no small cut. And you know what they say: the house always wins.